Ever been at Ibis Hotel? How was their customer service? Ibis Hotel is situated in Ikeja, Lagos. Book a room at the Ibis Ikeja hotel to enjoy a four star luxury experience. 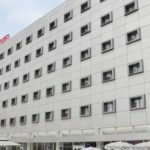 Hotel Ibis Lagos Ikeja offers fully air-conditioned rooms with an en-suite bathroom, a TV with satellite reception and full length windows. The hotel features an onsite restaurant ready to cater to all the meal requirements of the hotel guests, a variety of continental and local meals are served. Guests can also enjoy alfresco dining, an outdoor bar which offers both alcoholic and non-alcoholic beverage and drink options is also available. A gym and an outdoor pool flanked by recliner chairs are available for leisure. The hotel also features a conference hall and an ATM to ensure guests have access to unlimited cash flow at all times. A business centre is available at the Ibis Ikeja Hotel; Car-hire, free airport pick-up and concierge services can also be provided on request.